Christopher has been hinting, well outright asking for me to make Banana bread. On Thursday, I found some ripe bananas at Walmart. On Friday morning they were almost too ripe. Christopher said that after school he would help me make Banana bread and we could watch my favorite (childhood) movie, The Rescuers Down Under. I thought it was a great idea so I was ready for him. When he gets home he immediately went to get the iPad. Monday through Thursday is “no electronics”. He says, “uh huh” when I ask if he is going to help me make Banana bread. 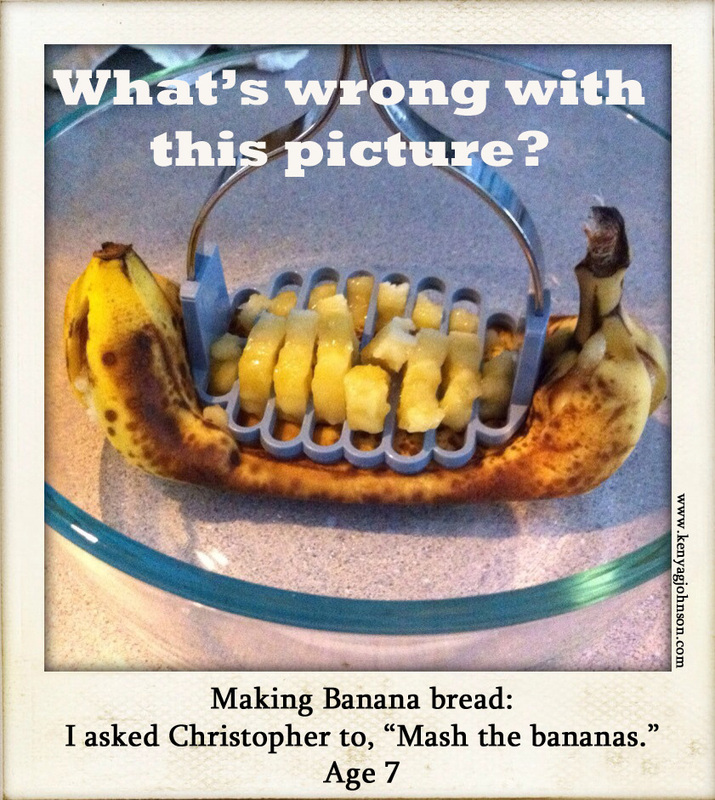 I take out a bowl and say, “Mash the bananas”. This is the result. Not intending to blog about it, I just created this photo to put on Pinterest and upload to Facebook. I sent it to my mom and she wrote back, “That’s a male development gene. Ask them to do something they really don’t feel like doing, and they do it wrong.” It was confirmed when my dad chimed in with, “She didn’t tell him to peel them first.” Really? Here's the thing... we never did watch The Rescuer's Down Under. Don’t you feel small the moment you realize that you were punked? How's that phonetic spelling workin' for ya?